Thanks to the generosity of the Letort PTO, every student in Letort Elementary School received a voucher for $5.00 to use for the purchase of a new book at the annual Letort Book Fair. Students can also win posters and the school earns Scholastic Dollars to be used for future purchases. Parents, grandparents and other interested parties can purchase books from teachers’ wish lists. The wish list books will be used in the classrooms for the enjoyment of all the students. 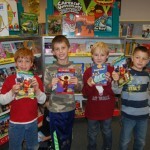 The book fair runs through Friday, November 16. It is open to the public from 1:30pm to 8pm on Thursday, November 15 and Friday, November from 1:30pm to 2:00pm. Letort Book Fair coordinator, Mrs. Lisa Eme, also encourages people to order books online after the book fair closes up on Friday. Purchases will be shipped free of charge to Letort Elementary. The online book fair runs until November 27. Check it out at http://bookfairs.scholastic.com/homepage/letort.